Bagh Bahadur is a 1989 Bengali film directed by Buddhadeb Dasgupta. Based on a short story by Prafulla Roy, this film explores the alienation of traditional art forms which are being edged out by the so-called modernity. 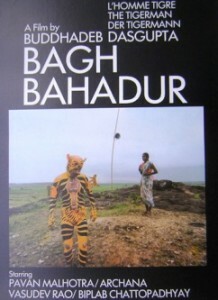 Bagh Bahadur is the story of Ghunuram, a labourer who takes time off his job every year to come to his village Nonpura, and becomes a Bohurupi to perform the tiger dance, an art form handed by a father to son for generations. This year is special as he hopes to get engaged to Radha, daughter of his fellow performer Sibal. However as they get ready for the performance, they find competition in the form of a travelling circus, with a newly captured leopard, which has caught the fancy of the villagers. They are no longer interested in his traditional art and are instead swayed by the charms of the circus. While Ghunuram struggles with the dwindling interest in his dance, to his utter dismay he finds that Radha has fallen for a circus performer. To salvage his pride, he has a last performance, where the tiger man enters the cage of the leopard and throws a challenge one last time..
Bagh Bahadur explores the cultural displacement of a traditional village artist changing times, when most traditional art forms are being edged out by the development. Ghunuram experiences fulfilment in following the tradition of the tiger dance, a break from his life as an oppressed labourer and into the joy of being a tiger-man; an acclaimed artist in his village who is loved and respected by all. The tragic conflict between the traditional and modern way of lives, and the depiction of how he slowly gets sidelined and helplessly watches everything dear to him being torn apart has been brought of beautifully on celluloid. The rural setting of the film gives it a rustic feel, with only a semblance of city life in its isolation. The plot is minimalistic where the elements of narrative are used to show what is already known, from what may be discovered. The director brings about the dramatic impact from the unfolding of the crisis and tension and by their consequences. For long, the Tiger has held a larger than life position in Bengal and Bagh Bahadur ironically symbolizes its decline in numbers as well as in the cognitive memory of the public. Only a trailer is available on You Tube.